With galvanised rope in many different constructions available on our site, it makes sense to choose carefully between the available options. The 8mm 6×19 galvanised wire rope we produce offers strength, flexibility and corrosion resistance, along with the option to be used in bespoke assemblies. 6 bundles of 19 galvanised steel wire strands form the exterior of this rope. The interior is made up of a fibre core, providing a flexible centre around which the rest of the rope is formed. The result of this design is a higher degree of flexibility, along with an overall lighter design than some similarly sized wire rope products. In terms of specific performance ratings, the full technical details are outlined below. The 3,926kg load capacity is perhaps the most important element of this rope’s potential as a lifting option. 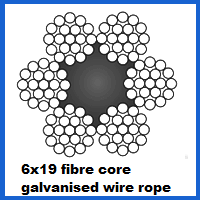 If you are looking for even more flexibility, our 6×12 fibre core galvanised rope range will deliver it in spades. If simple lifting sturdiness is more important, the 1×19 rope we produce is likely to be more attractive. All products in the galvanised rope range will be ideal for outdoor use, with rain drops and sea splashes doing little to corrode the surface. You can send us your details via email and a sales team representative will get back to you swiftly. You can also have a phone conversation with our specialists during office hours by calling 01384 78004 for quotes, help and further product details. 8mm 6x19 Galvanised Wire Rope Overall rating: 5 out of 5 based on 6 reviews.